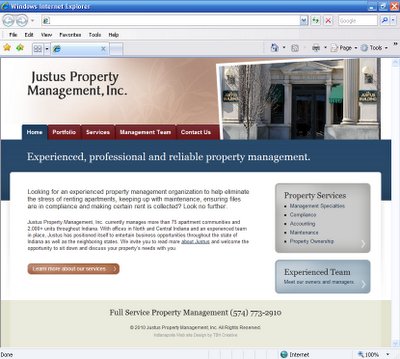 TBH Creative was hired by Justus Property Management in Nappanee, Indiana to redesign their one page web site. Their goal was to provide more information and communicate a professional representation of the high quality property management services they have offered since 1989. 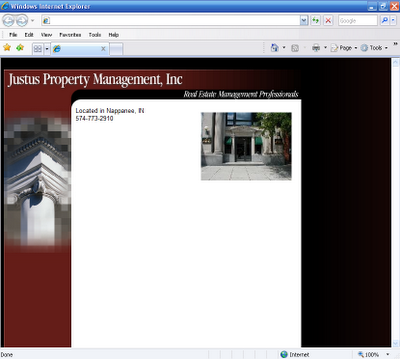 As a small web site, we focused in on the their message, use of photos, and designed a flexible and easy to use layout. For the design, we brought in some softer colors to compliment the dark red in their brand and the photo tones. Justus Property Management is a full-service management firm specializing in the professional management of apartment and group home communities throughout Indiana. At the present time, Justus is managing approximately 75 apartment communities, consisting of 2,000+ units. Their services include: Management Specialties, Compliance, Accounting, Maintenance, and Property Ownership. The experienced management team includes Steven K. Walters, Mitchell L. Walters, and Donna S. Corbin. Check out samples of properties in their portfolio. Looking for a reliable web design company? TBH Creative is not only dependable, but our services are high quality and our costs are competitive. Give us a call today to see if our services are a good match for your web project needs.